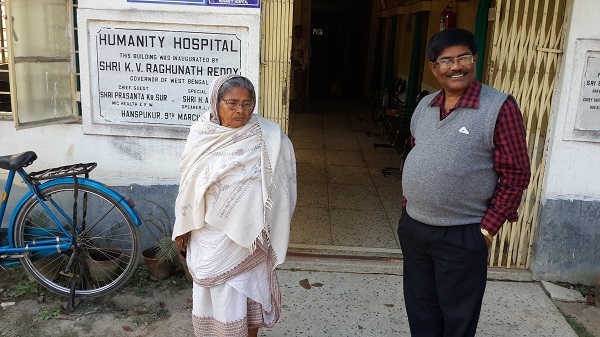 The untimely death of her agricultural labourer husband gave birth to the idea of building a hospital for the poor by the poor in the village of Haspukur, situated on the outskirts of Kolkata in West Bengal. But this was not the time to indulge in her dream as she had four hungry children — the eldest being eight years old and the youngest all of two — to feed. But all she knew was household chores, so she started working as a domestic help in nearby houses. “I have worked as an agricultural labourer, a maid and even polished shoes,” recalls the 69-year-old. But even during the darkest period of her life, she was farsighted enough to send her younger son Ajoy to an orphanage in Kolkata so that he got a better education than she could provide. Her other children, remained at home, either helping her with housework or working in tea stalls. She could ill-afford putting them through school. Soon she discovered that selling vegetables could fetch more money than working as domestic help. So she moved to Dhapa village and started selling vegetables there. 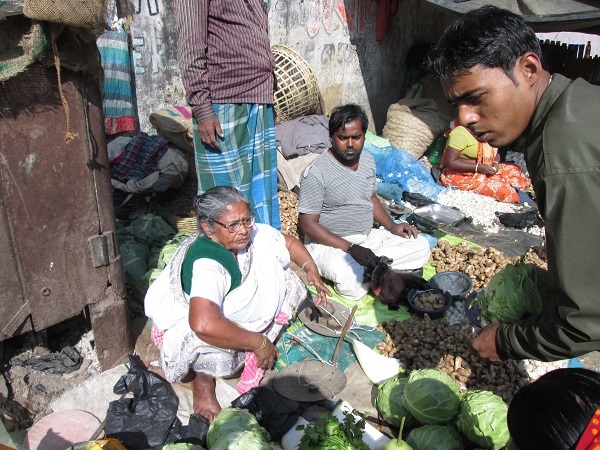 Once she got a hang of the business, Subhashini started selling vegetables in the bustling Park Circus market in central Kolkata. As her income increased, she started doing a little bit of savings. For 20 long years, she spent nothing on herself or her family, except for the educational expenses of Ajoy, who she identified to carry on her mission. Never disappointing his mother, Ajoy successfully completed his secondary education and then went on to clear the All India Medical Entrance test. Aided by a German scholarship, he joined Calcutta Medical College where he completed his medical course. In 1992, Subhashini bought an acre of land in her husband’s village, Hanspukur, with her live savings of Rs 100,000. “When I got to know the landlord for whom my husband used to work was selling the plot. I fell on his feet and requested him give me the plot at a lesser amount. Babu was kind enough to oblige to my request,” said an emotional Subhashini. Soon after the buying the plot, Subhashini moved back to her husband’s village and told her neighbors that she was willing to donate her one acre land for the hospital. Villagers would have to donate money to build a thatched shed that could serve as a dispensary for the poor. “While some villagers contributed in kind – providing bamboos, palm leaves, truckloads of earth, wooden planks, some offered their labour. Thus, a 20X20-foot temporary shed of Humanity Hospital came into being in 1993. Every member of the society contributed to the cause. It wouldn’t have been possible without their help,” she said. The clay-tiled hut from where the Humanity Hospital started functioning out in 1993. (Below) A three-story building was inaugurated in December last year in the Sunderbans, around 300 km away from its main three-story building in Haspukur in Kolkata. In 1995 the Governor of West Bengal laid the foundation stone to the hospital. After clearing infrastructural hurdles, the mother-son duo went about the town requesting doctors to spare some time from their busy schedule for their clinic. Their appeal went down well the medical fraternity and soon the thatched dispensary had six visiting doctors – a general physician, paediatrician, orthopaedic, ophthalmologist and a homeopath. Each one of them offered free service at least once a week. On the very first day, the Humanity Hospital treated as many as 252 patients. The facility hasn’t looked back since. Subhashini knocked on the doors of the local politicians and influential people to raise funds for their cause. A group of trustees – including doctors, eminent local citizens and serving IPS officers guided the hospital, which has now expanded to include gynaecology, cardiology, ENT, urology, oncology, diabetology and surgery. They now have 3 acres of land and the hospital has expanded to 9,000 sq feet spread over two floors. Through all this growth, Subhashini was clear about her goal. “This is a hospital for the poor. This is not a business. Yet, we knew that the hospital had to be self-sufficient. It cannot survive forever on donations,” she said. So while the poor got free treatment, those who lived above poverty line had to pay a minimal consultation fee. Still, this is not sufficient to cover the day to day expense of running a hospital. “There is a perpetual shortage of funds. We live from month to month. Thankfully we got some funds from donors of Satyamev Jayate and Reliance Foundation. But we haven’t got any funds from the government,” Dr Ajoy Mistry said. Now her elder daughter and son, who used to sell vegetables, also help in running the hospital. After Ajoy become a doctor, he inspired the youngest sister to become a nurse who also serves at the hospital. Currently, the Humanity Hospital has 13 different departments, catering to thousands of patients. “We offer a range of medical services from medicinal treatments to surgical cases both open and laparoscopic. We have a total no. of 45 beds, including 10 ICUs, available. Out of the total, 25 are completely free. We have both Indoor and Outdoor departments where 19 visiting doctors and several resident doctors provide round-the-clock service. We take care of variety of patients with wide range of need from simple medicinal treatment to different surgical cases with the help of specialist doctors at Humanity Hospital, Hanspukur. Thousands of patients every year through indoor, outdoor, mobile clinic as well as referral cases are getting the benefits from this hospital. We have also started a branch of our hospital in Sunderbans area,” said Dr Ajoy. Apart from routine hospital services, the hospital also provides free medical and cancer detection camps in different parts of the state where there is little or no medical facility. “We offer free-of-cost medicines, health advice and, in cases where hospitalization is needed, we offer free treatment through our Hospital centers,” said Subhashini. Life has come full-circle for Subhashini. With Ajoy at the helm of affairs, she now spends most of her time tending to the sick or playing with her grandchildren. Though she looks relaxed after passing on the baton, she won’t retire as long as the urge to serve the needy keeps surging within.